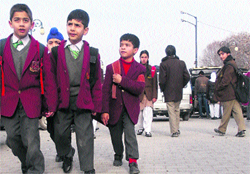 The state government today announced the winter vacations in schools across Kashmir valley. In a late evening announcement, it was declared that all government as well as recognised private educational institutions in the Kashmir division, including winter zones of Jammu division upto middle standard, shall observe winter vacations from December 3 till February 28 next year. International human rights group Amnesty International today said the authorities in Jammu and Kashmir had arbitrarily detained 16-year-old Danish Farooq and were “treating him as an adult rather than a child”. With Kashmir's theatre community planning to hold a major festival on the World Theatre Day in a bid to revive art here, artists are still awaiting the completion of renovation works at the summer capital's only available auditorium — Tagore Hall. Family members of a 16-year-old protester, who is in police custody for the past 11 days on charges of attempt to murder and throwing petrol bomb, today alleged that they were not being allowed to meet him. They said they were instead harassed by the police. Danish Farooq, who according to the police is 16 years and five months old, a resident of Srinagar’s Chattabal locality, was arrested on November 19, his lawyer said. Rafiqa Begum (52) of Magam, 12 km from Handwara in Kupwara district, is waiting endlessly for her husband ever since he disappeared in March 2005. Her husband, Mohd Aslam Sheikh, went missing from Punjab in March 2005 and he has remained untraced since then. The ruling National Conference party today alleged former Jammu and Kashmir governor and the main opposition party of killing ‘innocent people’ in 1990, incidents which have been dubbed as massacres. A local court here has directed the police to produce the statement of facts by December 1 in connection with the arrest of a 16-year-old boy Danish Farooq Wani. Stressing for sectarian unity, the chairman of moderate faction of Hurriyat conference has called for a joint meeting with Shias and Sunnis on December 2. A day after the season’s first heavy snowfall in the upper reaches and incessant rains in the plains, Friday saw a sunny day in the city as the State Meteorological Department has predicted that weather would remain dry for the next 24 hours. Traders in north Kashmir’s Sopore town cancelled a strike scheduled for today, after getting an assurance from the administration that a special team would be constituted to look into the cases of burglary. To give boost to the technology-based mechanised farming in the region, the agriculture authorities organised a farm machinery mela in Acahbal area of south Kashmir on Thursday. The last group of three Hajis is expected to land at Srinagar international airport on Saturday. President of the Jammu and Kashmir Pradesh Congress Committee Prof Saifuddin Soz today expressed grief over the demise of former Prime Minister I K Gujral. Six passengers were injured in two separate road accidents in Kashmir valley, police today said. Three people were injured when a passenger cab they were travelling in turned turtle at Kitchma near Sheeri in Baramulla district of north Kashmir. The three injured have been shifted to a hospital where they are being treated, a police spokesman said. However, high and higher secondary schools in the Valley will observe winter break from December 15 upto February 28, J&K Secretary Education Farooq Ahmad Faktoo said. As to why the government has announced the school vacations in advance, Faktoo said the vacations have been announced as per the schedule. “We have not declared the vacations in advance. In the past as well, we used to declare winter vacations upto the elementary level in the first week of December,” he said. The government usually announces winter vacations in all government-run educational institutions in the Valley from December 15. The clamour for early announcement of the vacations, however, had increased this year due to early onset of winter and chilly conditions. Sources said there prevailed a confusion in sections of the government whether to announce early vacations or not. It was evident from the fact that earlier in the day, Director School Education, Kashmir, Mohammad Shafi Rather had told The Tribune that there was no proposal to declare the vacations early. After the region started receiving season’s first heavy snowfall in the upper reaches along with rain in the plains since Wednesday evening, parents as well as teachers were expecting the authorities to declare the winter vacations early. The early announcement of the vacations has irked many in the Valley. They say officials at the helm of affairs announce winter vacation schedule in Kashmir as per their own convenience. “Most of the schools are yet to distribute books or assign home work to the students for the winters. The sudden announcement of vacations is definitely going to affect the working of many schools,” head of a private educational institution said. The group, which has been vocal over the detention of teenagers in Kashmir in the past, has demanded the state to upgrade its Juvenile Justice law in accordance with international laws. It called for an immediate end to “arbitrary and unlawful detention” of the teenage boy. “Farooq(Danish) is a child under an international treaty that is binding upon India and so the manner of his arrest and detention must be compatible with this treaty,” Amnesty International said in a statement. The group said the boy should be moved to juvenile detention home if the court decided he had to remain in detention. “He should be granted all the safeguards and protections guaranteed to children by the UN Convention on the Rights of the Child and for judicial proceedings to go forward in accordance with international human rights law. He should also be granted, without delay, access to his family and they should be kept informed of his whereabouts and condition as well as access to a lawyer of his or his family’s choice,” Amnesty International added. The police said the 16-year-old boy is not a minor under the state laws which treat anyone who attains the age of 16 year as a major. Amnesty International also claimed the teenage boy’s family had been “denied the right to communicate with him or see him and is currently unaware of his condition”. “India is legally obliged under the UN Convention on the Rights of the Child, which it ratified in 1992, to establish laws and procedures specifically applicable to children and to define minors as all individuals younger than 18,” it said. Amnesty International also urged the authorities to “halt the practice of arbitrary detentions in the state, in particular of children. Before the eruption of militancy in the state, the Tagore Hall used to be a hub of theatrical and cultural activities and the theatre community wants it to be thrown open by the World Theatre Day on March 27. "There is no other auditorium available for us as we want to hold a big event on Kashmir theatre on March 27. Even though renovation works have been going on for around five years, we were told that Tagore Hall would be opened by December 5. However, there has been no headway on setting up seating arrangements and lightning facilities which are essential for theatre," Kashmir Theatre Federation president M Amin Bhat said. After it was occupied by the CRPF in the heydays of militancy when cultural activities in Kashmir had taken a backseat, Bhat said the Tagore Hall was reopened in 2000 briefly only to be closed again due to drainage problems. "If reopened now, it would go a long way in helping boost theatre-related activities in Kashmir and restore its former glory," he added. KTF general secretary Mushtaque Ali Khan said there were no signs of completion of the hall despite several assurances made by the authorities. Khan also sought the intervention of Governor NN Vohra, Chief Minister Omar Abdullah and Minister of Culture NR Jora so that the hall was thrown open at the earliest. J&K Academy of Art Culture and Languages (JKAACL) secretary Khalid Bashir admitted that there had been a delay in its renovation, saying the works “should have been completed by now”. The JKAACL secretary said the executing agency, Jammu and Kashmir Projects Construction Corporation (JKPCC) was slow in completing the renovation work. Family members of a 16-year-old protester, who is in police custody for the past 11 days on charges of attempt to murder and throwing petrol bomb, today alleged that they were not being allowed to meet him. They said they were instead harassed by the police. Danish Farooq, who according to the police is 16 years and five months old, a resident of Srinagar’s Chattabal locality, was arrested on November 19, his lawyer said. The boy was first locked up at the Shaheed Gunj police station for nearly a week and was immediately arrested outside the court complex by the Kralkhud police after he got bail on November 26. He remains locked up at the said police station since then. A police spokesman had earlier said the boy was a notorious stone pelter who was involved in a number of stone pelting incidents including a petrol bomb attack. The accused teenager has been arrested under Section 285, 307 and 336 of the RPC. “When we went to meet him, a police officer shouted at us and threatened to arrest to us,” said Farooq Ahmad, Danish’s uncle. He said they were worried about the health of the boy and wanted to enquire about his well-being. “We don’t know how he is being kept. We just wanted to enquire about his health. We don’t know even if he has been beaten,” Farooq said. The accused boy’s lawyer Babar Qadri had earlier claimed that Danish was “beaten and tortured by police” during his detention at the Shaheed Gunj police station. Kralkhud police station SHO Aftab Ahmad said neither of the boy’s parents had come to meet their son. “Only his two maternal uncles came to meet him. I believe they are the ones responsible for the boy’s plight. Their own children are doing fine but they have not taken care of their sister’s son,” the SHO said referring Danish was under the tutelage of his uncles. The officer said had the boy’s parents come to meet, they would have been allowed to meet him. Farooq, however, said he along with the boy’s father (also named Farooq Ahmad) had gone to the police station on yesterday but were stopped from entering the station. Human rights group Amnesty International has often called on the J&K government to update its juvenile justice law saying the present version of the law was not consistent with the UN Convention on the Rights of Children. The Jammu and Kashmir Juvenile Justice Act treats only those boys as juvenile who have not attained the age of 16 years. Aslam used to visit different cities in Punjab during winters to earn his livelihood. Mother of three children, including a minor son, Rafiqa barely manages a living by doing household chores in her neighborhood. Her 15-year-old daughter Sumiya Aslam, who is studying in Class X, has to help her mother in household chores. This has badly affected her studies at this tender age. Absence of their father has put the future of children at stake. “I somehow manage to pay school fee of my daughter. I clean houses and utensils of families in the neighborhood to feed my children,” said Rafiqa. Rafiqa has been exhausted of all her resources in search of her husband but in vain. “I exhausted all the resources in his search after going from pillar to post. His disappearance has badly affected our life, especially the education of children,” she rues. “At times, my children are forced to stay sleepless due to hunger. After working at others’ houses, I barely manage to feed my family,” she says. Her son Abdul Hamid Sheikh plucks fruits during summers to support the family. “I earn some money during the fruit season. I work with growers in orchards for at least two months,” said Abdul Hamid, a school dropout. Surprisingly, the police has not even registered an FIR of Rafiya’s missing husband, she complains. “Despite repeated pleas, the police did not register an FIR in my husband's case. Many people visited me but nobody lent a helping hand,” she narrates her woes. “It is amusing to see a malicious statement from the opposition as they seem to have forgotten how their leader showered praise on Gujarat Chief Minister Narendra Modi, partnered with (Governor) Jagmohan to kill innocent people at Gawkadal, Handwara, Hawal,” NC spokesman Tanvir Sadiq said. More than a hundred people were killed at Gawkadal, Handwara and Hawal localities in the Kashmir valley in early 1990s. It was believed that these incidents had given an impetus to the armed insurgency in the state. Jagmohan was the governor of Jammu and Kashmir in 1990 when militancy erupted in the region and Mufti Mohammad Sayeed, who founded PDP in 1999, was the Union Home Minister when the infamous massacres were allegedly committed in the state. This is for the second time in last three months that the NC has levelled charges of massacre against the main opposition and the former state governor. NC and PDP, two powerful mainstream regional parties in Jammu and Kashmir, have launched a diatribe against each other in the past month and accused each other of failing at the development front and creating a political mess in Kashmir. “It is a very well known fact that the Peoples Democratic Party and its leaders are famous for intrigue, dirty machinations,” Sadiq said. The NC spokesman asked the Peoples Democratic Party to look at the ‘trajectory of their founder’ before issuing “bizarre statements”. “From Congress, Janata Dal, Janata Party, MUF (separatist Muslim United Front) to forming Peoples Democratic Party, an offshoot of communal forces, the Muftis symbolise the height of political opportunism,” Sadiq said. Sadiq called the Peoples Democratic Party a “bunch of turncoats and corrupt politicians”. The directions were issued today by Chief Judicial Magistrate, Srinagar, Rajeev Gupta in a contempt petition filed by the parents of Danish Farooq against the SHO of the Kralkhud police station Srinagar, where the boy is currently lodged. As submitted by Babar Jan Qadri, the counsel representing the aggrieved parents. The court had earlier directed the police authorities concerned to produce a report in the bail application of Danish Farooq, who was re-arrested by the Kralkhud police on November 26. The police had arrested Danish, hailing from Chattabal area of Srinagar, on November 19 in connection with an FIR registered against him at the Shaheed Gunj police station on stone pelting charges and released him on bail on November 26. However, he was re-arrested on the same day by the police authorities from the Kralkhud police station. “Soon after his arrest, we had moved a bail application before the competent court on November 29, which had directed the SHO Kralkhud to furnish the report. However, so far no report has been furnished. We do not know under which charges Danish has been arrested,” counsel Babar said. This, he said, has forced the parents to move a contempt application against the concerned SHO for disobeying the directions issued by the court. On the other hand, the Chief Judicial Magistrate Srinagar, before whom the contempt petition was moved, today asked the concerned SHO to submit a statement of facts. “The applicant is on (record, saying) that despite service of direction by this court, you have not submitted the said report. You (SHO Kralkhud) are as such directed to furnish the statement of facts to this court by or before December 1,”the CJM said in his orders issued today. “Mirwaiz once again stressed that Kashmiris should show unity and foil the evil designs of the agencies, which want to create fissures in the Muslim society of Jammu and Kashmir,” a Hurriyat spokesman said. He said Mirwaiz, who is also the head of Muthaida Majlis-e-Ulema (joint council of Ulema) has called a meeting of the Sunni-Shia coordination committee on Sunday. “The meeting would take place in the house of Agha Syed Hassan Al Moosvi, a senior Hurriyat leader, in Badgam. Members representing their respective communities would discuss the current situation and formulate an effective strategy to tackle it in the future,” the spokesman said. Terming the imposition of curfew a ‘dictatorial tactics’ by the government, the spokesman said the Srinagar police had restricted lakhs of people in their houses in the downtown areas of the city and did not allow them to offer Friday prayers. “APHC chairman Mirwaiz Umar Farooq has sternly castigated the government’s decision to turn Srinagar into a battle zone and make lakhs of people hostage in their own houses,” the spokesman said. “Mirwaiz said it was highly condemnable that due to restrictions people could not move out of their houses to get daily essentials of life and offer the Friday prayers. He said the restrictions were also a direct interference in the religious matter of Muslims and termed this policy of government as undemocratic and authoritative,” the spokesman added. The day temperature in the summer capital jumped after it drastically dropped by 9 degrees to 6.3 degree Celsius on Thursday. The maximum temperature in the city was recorded at 11.3 degree Celsius, an official of the Met department said. The minimum temperature in the city was recorded at 3.1 degree Celsius. However, the weather officials warned the night temperature is expected to plunge to minus 1.0 degree Celsius on Saturday and will further fall in the coming nights. There were no reports of fresh snowfall in the region, the official said. On Thursday, the Valley received heavy snowfall in higher reaches with Gulmarg resort in north Kashmir recording 1.5 feet snow. The strike was cancelled after the traders held a meeting with Deputy Inspector General of Police, north Kashmir; Superintendent of Police, Sopore and Sub Divisional Magistrate, Sopore. “The DIG assured us that a special team headed by an inspector rank officer will look into all the cases of the recent thefts in the town. They would take steps to curb theft activities in the town,” pesident of the Sopore traders federation, Mohammad Ashraf -Ganai said. He said the burglars were on prowl in the town and many shops were looted in recent past. After the working committee meeting earlier this week, the trades had called for a shutdown on Friday to protest the failure of the police to nab the culprits involved in these thefts. "After the assurances, we hope that police will solve the burglary ases in Sopore" said a trader. The authorities concerned provided an incentive of worth Rs 38.16 lakh to the farmers on purchase of farm machinery and equipment, a government spokesman said here. Various registered dealers displayed their machinery at the stalls, he said. “Sub-divisional agriculture officer Achabal said the farmers of the sub-division Achabal purchased 141 irrigation pump sets, 19 power tillers, 25 tractors, 19 foot sprayers, and 8 vermi compost units and 19 poly green houses were established. For all this, an incentive of Rs 38.16 lakh will be provided to the farmers,” the spokesman said. During the function he said, District Development Commissioner Anantnag stated the coordination between the agriculture department and farmers can achieve a state of self sufficiency in the agriculture sector. The technology-based mechanised farming has revolutionised the agriculture sector. The Chief Agriculture Officer, Anantnag, who was present on the occasion, said the main aim of these melas is to make farmers aware about various farmer-friendly schemes launched by the department. “Besides, these melas also facilitate farmers to select the agriculture machinery, equipments and tools of their own choice at their doorsteps,” the spokesman quoted the officer. “All three Hajis have returned. They will be arriving Srinagar on Saturday,” Executive Officer of the State Haj Committee Dr. Abdul Salam Mir said. He said the last group would, however, reach here via New Delhi. This time Air India operated direct Haj flights from here to Saudi Arabia after a gap four years. As many as 9,170 pilgrims from the state performed Haj this year. This year’s quota for Jammu and Kashmir had been increased from 8,441 to 8,670. In addition, private Haj operators facilitated around 500 Haj pilgrims. The first Haj flight from Saudi Arabia had reached Srinagar airport on November 2 and it was received by Chief Minister Omar Abdullah. The pilgrims had started returning after the Eid-ul-Adha festival, which culminates the pilgrimage. “I express my deepest anguish at the passing away of former Prime Minister Inder Kumar Gujral. He was a great contemporary public figure of India,” Soz said in a statement issued here. For JU, Daud Iqbal was the chief destroyer with a five-wicket haul. In reply, JU overhauled the target for the loss of 7 wickets in 19 overs. Prakshit was the top scorer with a defiant 40-run knock whereas Vishal (25), Noor Beig (19), Daud Iqbal (17) and Sumit (17) were the other contributors. For HP Shimla University, Mukesh was the pick of the bowlers with three wickets while Rajesh chipped in with two wickets. The boys’ team had last laugh against Uttarakhand by 32-11 while the girls’ team trounced their opponent from Vidyabharti. Now, in their next group matches, the boys’ team will take on Manipur while the girls’ team to face against Delhi .